Gov. Tom Wolf and other Pennsylvania leaders planned to offer up to $4.6 billion to Amazon if the company chose Pennsylvania for its second headquarters. Pennsylvania Gov. Tom Wolf and other officials were prepared to offer Amazon up to $4.6 billion in incentives if the company had chosen to locate its second headquarters in the state. On Tuesday, Amazon announced it had chosen New York City and Arlington, Virginia, as the locations for its dual-office second headquarters. Collectively, New York and Virginia offered Amazon more than $2 billion in incentives. The state sets aside an additional $100 million for transportation. The $4.5 billion would be paid to Amazon through a new grant program designed by the DCED, according to Davin’s letter. Had it chosen a site in Pennsylvania, the state would have been paying up to $180 million per year for 25 years. A total of five jurisdictions in Pennsylvania bid for Amazon’s HQ2, including Pittsburgh, Philadelphia, Delaware and Dauphin counties and an economic development group in the Northeastern part of the state. Pittsburgh and Philadelphia made Amazon’s list of 20 finalists in January. In a statement Wednesday morning, DCED spokesman Michael Gerber said the incentives offered to Amazon would have also applied to other businesses in the state. Gerber also noted that the incentive package would have needed approval from the state Legislature before it could be given to Amazon or any other company. 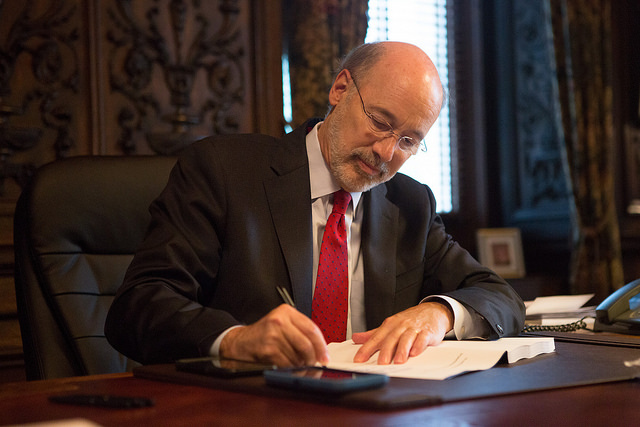 A second letter from Wolf, Republican state Senate President Pro Tempore Joe Scarnati and Republican Speaker of the Pennsylvania House Mike Turzai similarly promised the incentives and called a Pennsylvania-Amazon partnership a “win-win.” The three state leaders promised to enact legislation authorizing the incentives if Amazon chose a Pennsylvania location. In Davin’s letter, he also highlighted the state’s “talent pipeline,” citing Wolf’s increases in K-12 education funding and promise to have 10,000 students majoring in a STEM (science, technology, engineering and mathematics) program at the state’s public universities by 2020. He also made a pitch that Pennsylvania was the right place for Amazon culturally. You can read the two letters below.